The Western Antarctic sector of the Southern Ocean is the regular feeding ground of a large number of fin and humpback whales of the Southern Hemisphere. Around 5,000 fin whales likely migrate to its ice-free waters during summer, along with at least 3,000 humpback whales. These estimates follow a ship-based helicopter survey of whales in Antarctic waters. A net trawl survey for krill was also conducted to see if the distribution of these whales and specific krill species are connected. The study was led by Helena Herr of the University of Veterinary Medicine Hannover in Germany, and is published in a special issue on "Antarctic Peninsula Shelf Biology" in Springer's journal Polar Biology. Herr's team produced distribution maps that predict the densities in which humpback (Megaptera novaeangliae) and fin whales (Balaenoptera physalus) likely occur in the Bransfield Strait and Drake Passage. It was found that the two whale species do not share the same habitat or feeding grounds around the West Antarctic Peninsula. An estimated 3,024 humpback whales frequented the coastal parts of the Bransfield Strait in summer 2013, while at least 4,898 endangered fin whales were found along the shelf edge in the Drake Passage. The krill survey shows that Euphausia superba is the most widely distributed and abundant source of food available to whales in the area. The krill type Euphausia crystallorophias occurs sporadically in smaller numbers near the coast, and Thysanoessa macrura generally beyond the shelf edge. The relationship between whales and the krill they feed on is not a simple one. At the time of the survey, fin whales fed in an area dominated by Thysanoessa macrura. They are also known to feed on Euphausia superba. Fin whales therefore seem to opportunistically feed on whatever prey aggregates around the shelf edge. There isn't a clear relationship between humpback whales and the presence of a particular krill species either. The whales seemed to be located in all areas of the Bransfield Strait regardless of how much krill was available. Humpback whales did however tend to occur in sectors with at least a medium concentration of Euphausia superba. Humpback whales seem to have adopted migration patterns and foraging strategies that lead them to areas likely to provide, on average, sufficient amounts of prey. "In the light of increasing effort by the commercial krill fishery and climate change-related effects on krill biomass, dedicated surveys that target both krill and their main predators, such as baleen whales, need to be undertaken concurrently. This is to monitor and ensure that habitats in the Southern Ocean will continue to support a humpback whale population that has just touched pre-exploitation numbers," says Herr. 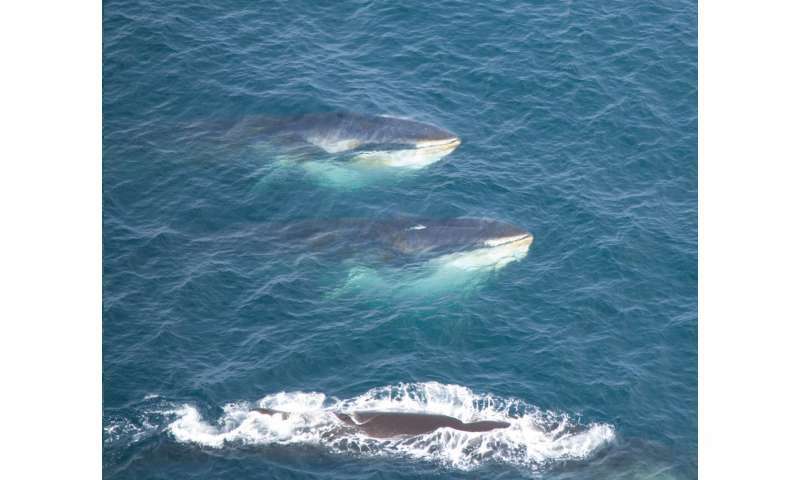 Efforts should also be strengthened to investigate the ecology and feeding strategies of endangered Southern Hemisphere fin whales, since little is known about their connection to and dependency on local prey stocks.